Database Utilities is a collection of data management tools designed to help C&P system managers maintain their database. These tools track and control the database’s size, test it for damage, and export/import data to and from other systems. User access to Database Utilities is controlled from the Users, Access & Password window; a user doesn’t have to have manager-level access privileges to use Database Utilities. Access to the functions on the Utilities menu, including Database Utilities, Purge, Re-numbering, etc., can be restricted to only certain staff members -- only those who are responsible for administering the database. Change Database Size extends the size of the database to accommodate more data. Normally the database expands automatically as new work is added. The database can be pre-sized to prevent disk fragmentation that affects its performance. When the database reaches 256mb, this tool can add a new segment to expand its capacity. Export Data is used to extract selected client, job, cost, and accounting information from your Clients & Profits database, saving it as text files that can be imported into another database, spreadsheet, or word processor. Import Data is used to bring data from another database or spreadsheet into your Clients & Profits X database. Print Data File Report lists the records stored in each of the 50 data files that comprised the C&P database (e.g., jobs, clients, costs, A/P, etc.). The report also compares the database’s file size with its data size, showing how much free space is available for new data. Quick Check performs a “quick check” of the database, which looks for various kinds of data corruption. Continuous Quick Check (Diagnostic mode) There is a built-in diagnostic mode in Clients & Profits X that replaces the Quick Checker utility. This utility will check for database damage every few minutes then report any problems immediately. It's not a report, so Continuous Quick Check never really finishes. It simply checks for data damaged continuously. You'll only see a message on the screen if the diagnostic mode encounters a problem. Otherwise, everything's fine. Check Data Files performs a thorough top-to-bottom check on the database’s integrity. It is a more elaborate and thorough -- and much slower -- version of the Quick Check. Repair All first checks every data file in the database for damage, then attempts to repair any problem it finds. Reorganize (Optimize) Selected Files converts data from older versions of Clients & Profits X to the latest version. Reorganization usually happens automatically the first time a new software update is installed. It is used only is special cases where the conversion didn’t finish. Re-index Selected Files rebuilds the index table that is used to remember where each bit of data is stored in the database. Indexes are selected fields that are used to find records, such as job numbers and client codes. Each data file has its own index, which is updated each time a record is saved. If an index is damaged or incomplete, some records won’t appear on reports. This tool ensures that the indexes are valid in each data file. Repair Selected Files attempts to repair damaged on data files selected by the user, instead of repair all files. It’s a more selective version of the Repair All tool. Some Database Utility functions can’t be used if other people are sharing the database. Everyone should quit Clients & Profits X before you repair, re-index, or reorganize your database. However, you can export, import, and check the data while other people are working. A technical supplement, The Clients & Profits Database Guide, is a step-by-step troubleshooting and maintenance guide to the C&P database. 1 Choose Setup > Utilities > Database Utilities. 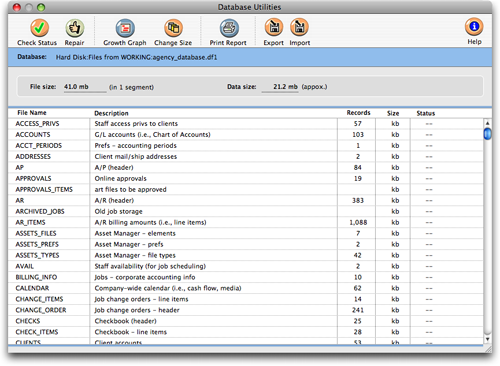 The Database Utilities window opens (see below), listing the various data files and their record counts (i.e., the number of clients, jobs, costs, etc.) The database is checked, analyzed, and repaired by clicking on the window’s toolbar buttons or choosing menu commands. Charting growth. 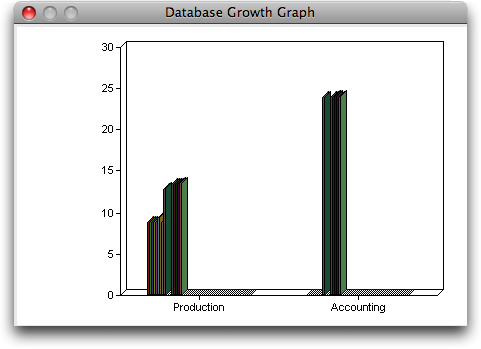 The database’s size is calculated each time the Graph button is clicked, creating a different point on the graph. The graph is a helpful tool for tracking the database’s growth over time.